One of my favorite movies from my childhood, Back to the Future makes its high-definition debut next week in a great Trilogy collection packed with new and older special features. The movies themselves are the highlight, especially the fun original, and with newly restored picture and sound, watching them on Blu-ray is like going back in time. But the Blu-ray is sharper and shows more details than the films have ever shown before. The colors of the Enchantment Under the Sea dance are bright, and you can more easily read the posters hanging in the school halls. The Blu-ray comes with some special features from earlier DVD editions, including deleted scenes and three making-of featurettes, but it has plenty of new extras too. The best is the six-part Tales From the Future documentary, which includes interviews with director Robert Zemeckis (The Polar Express), producer Bob Gale (Used Cars), executive producer Steven Spielberg (Jaws) and actors Michael J. Fox (Doc Hollywood), Christopher Lloyd (My Favorite Martian) and Lea Thompson (TV’s Caroline in the City), to name a few. They are candid in their talking, revealing fun behind-the-scenes stories, such as how Spielberg saved Back to the Future from being called Space Man From Pluto, as well as casting information. Actress Claudia Wells, who played Fox’s girlfriend in the first film but was replaced by Elisabeth Shue (Hollow Man) in the last two, is back to explain why she didn’t reprise her role. Watch out for some quick footage of Caprica‘s Eric Stoltz playing Marty McFly. The documentary looks back at the genesis of the movie through its becoming a successful franchise. And fans get details about how the scripts evolved and why, such as the decision to make the time machine into a DeLorean and the original method of getting back from 1955. And crew members talk about the movies’ designs, from re-creating the past to imagining the future. Spielberg reveals that he was hoping the self-lacing shoes shown in the second film would have been invented by now. 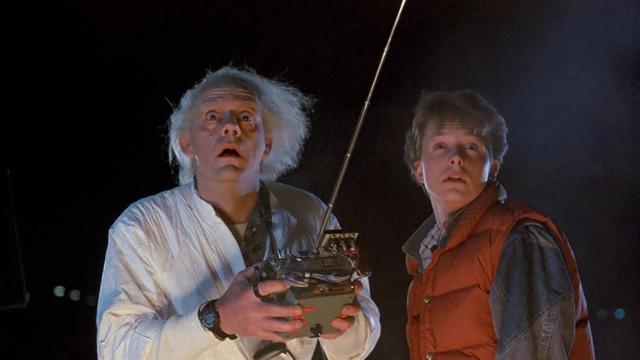 In another featurette, for science fans who have long debated the franchise’s time travel elements, author and physicist Dr. Michio Kaku explains why the Back to the Future Trilogy got it right when other movies haven’t. The set also has commentaries (including entertaining Q&A commentaries with Zemeckis and Gale), music videos, a Q&A with Fox and storyboards for the original ending. There’s some overlap in the special features, with many of the behind-the-scenes stories being told multiple times, but it doesn’t matter. Overall, this is great 25th anniversary to Back to the Future. The only downside is that the movies are only available in this trilogy set, but we’d guess Universal will release them separately sometime … in the future.